Andrew has been the Minister here since November 2015. First studying at Canterbury Christ Church University (Music and Religious Studies) before working for the church and training for Baptist Ministry at Spurgeon’s College, London. He served as Minister at Central Baptist Church, Leicester before returning to Canterbury with his wife (Jenny) and three daughters (Hope, Ruby-Grace and Anna). He spent most of his childhood in East Anglia, supports Arsenal, Leicester Tigers and Ulster (mainly with pressure from his in-laws!) Enjoys working with Christians and churches across the city, serving the wider baptist body to glorify God and see His kingdom here. Tom, Minister in Training since September 2017, works for the church alongside studying at Spurgeons College. Tom grew up in Canterbury and has had links with CBC since he was a baby. He was in the Boys Brigade as a boy and returned to serve there in 2014. Having committed to Brigade, Tom with his wife Cassie chose to attend the church one Sunday morning and felt so welcomed that they chose to stay. He is currently enjoying overseeing student and young adult ministry while undergoing his training. He also has a passion for the marginalised and vulnerable and is passionate about his work with The Lighthouse Project providing safety and security to those in need on a Wednesday evening. Tom lives with his wife and two cats and enjoys all sport especially football (West Ham), athletics and squash. 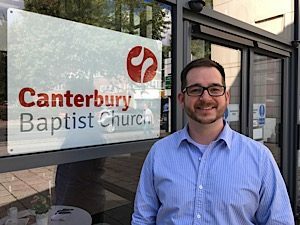 Stephen joined the Staff Team in July 2017. 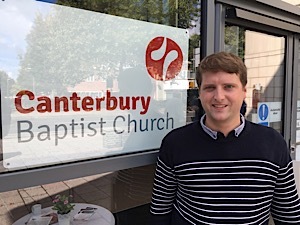 He had previously been a primary school teacher and a training local preacher in the Methodist Church before making the jump to working and worshiping here at CBC. He has a wife called Doreen, who is a pharmacist and lives with Stephen in sunny Ramsgate! Stephen actually comes from Ramsgate and went to university at Canterbury Christ Church. He loves cooking (and eating his wife’s delicious food!) and is a big sports fan, supporting Manchester United, the Indianapolis Colts and Kent Spitfires as well as playing badminton and other sports as often as he can. 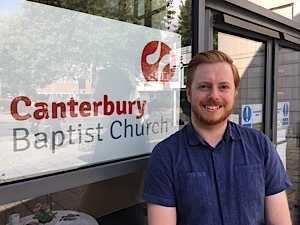 Stephen is very excited about working here in Canterbury and trying to bring churches and people together to both make the name of Jesus known and make His Kingdom work happen here for the good of those who live and work in the city. Hannah has been working with our children and youth since September 2017. Having grown up attending CBC with her family, Hannah went on to study English and Drama at DMU in Leicester before moving to London to spend some time recruiting headteachers for schools and academies across the country. Having trained as a Youth Ministry Intern at St James Muswell Hill alongside studying at Cornhill on the LMTC program, Hannah is really pleased to be back at CBC, serving our younger members. You’ll often find Hannah enjoying a ‘proper coffee’ while catching up with friends and family. She see’s it an enormous privilege to share Jesus with the children and young people at CBC, and is excited by what God is doing through this ministry.